A weekly published in New York city. The first number appeared on March 5, 1869, Moritz Ellinger being the publisher, and from Nov. 10, 1871, to Feb. 23, 1872, also the editor. On Oct. 4, 1878, Harry H. Marks became the occupant of that position. The last number was issued Feb. 21, 1879. During the last two years of publication (vols. ix. and x.) the periodical was entitled "The Reformer and Jewish Times; A Journal of Progress in Religion, Literature, Science, and Art." It contained an English and a German part in which literary, biographical, Talmudic, and rabbinical articles were published, reprinted, and translated. Jewish news, correspondence, and sometimes sermons appeared in its pages. 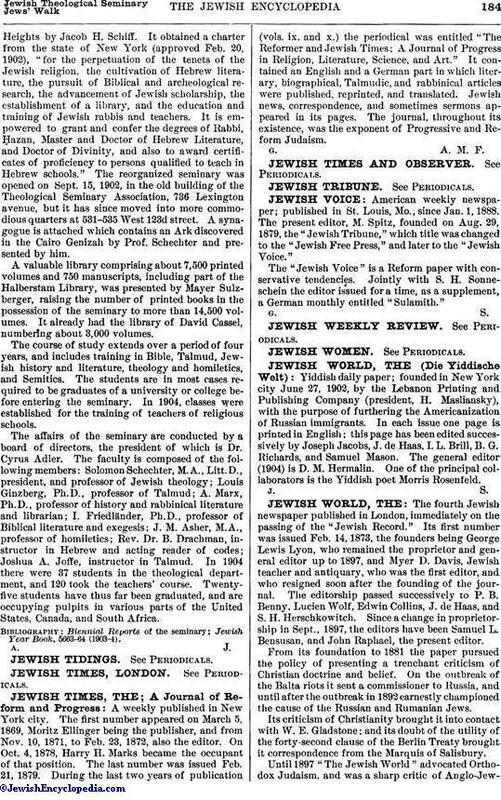 The journal, throughout its existence, was the exponent of Progressive and Reform Judaism.